The Honey Badger, Mellivora Capensis, is so named as it is believed that it follows a bird, the Greater Honeyguide, to a beehive. Once the Honey Badger opens the beehive, the Honeyguide gets its sweet share. The fact that it survives any number of bee stings is eloquent testimony to the toughness of this creature. It is fearless and aggressive and recently at Marula Boma the guests were amazed to see a Honey Badger chase off three Hyenas. 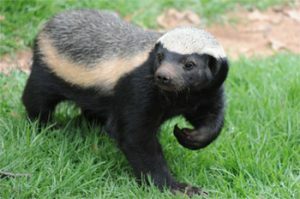 As a defence mechanism, the Honey Badger emits an extremely foul-smelling odour. No self-respecting carnivore would seriously think of getting such a small amount of smelly meat ! Patrick and his wife, Iwish. On the 23rd went to Kruger for the day, good day of sightings – 2 rhinos before reception, 3 male lions at Nsemani dam, leopard 7km after Nkaya pan, buffaloes at Orpen pan and elephants all over. On the 24th Kruger again. Sweni – Black rhino before Welverdiend windmill, buffaloes 4km before reception, 3 male lions on S 40 , White rhino Sweni road and elephants all over. On the 25th Kruger again – 5 lions before Nsemani dam, rhino at Sweni and buffaloes at Mudzandzeni, more general game on Sweni road, Secretary bird Martial eagle at Sweni and elephants all over. On the 26th 3 male lions at Sweni dam, rhino H6 and Welverdiend. Buffaloes at Orpen gate, leopard Timbavati riverbed and elephants all over. The winter cold has ended bringing rise to the heat of summer, the dry bushveld remains. The summer rains have hinted their arrival, but haven’t quite kicked off. Certain parts such as Marc’s Treehouse Lodge, have received a few exciting thunder storms. The trees are starting to change from a dull brown to a beautiful array of greens. The browsers are thrilled with the selection in leaves, such as the kudus around the camps. The grazers are still living off the bare minimum, with grass being in short supply. Around Marc’s Camp we have frequents visits from giraffe, Nyala and the occasional herd of buffalo. This makes Marcs Camp a beautiful place to be, so close to nature. I came across a tower of ten giraffes on one of my morning walks. They all stood completely still, posing for the camera, until eventually the fear factor kicked in and they all stampeded off into the bush. The warthogs are always fun in the mornings, if you catch them just at the right time. They stay in burrows overnight and leave first light in the morning. When on the bush walks we always advise to stay away from the entrance to their burrow, just in case one decides to zoom out and surprise you. The largest of our antelope species around the camp are the kudus – they are impressive jumpers and can often be seen standing around in the shade, taking refuge from the heat of the sun. Katekani lodge is looking beautiful, the thick bush around the camp gives it that wild feeling. We often see the resident Bushbuck, with their beautifully painted faces. The paths are often covered in wildebeest tracks, they must move around in secret during the early mornings. 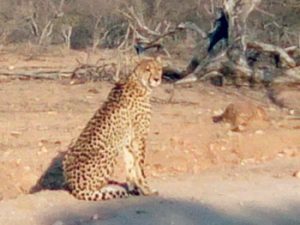 The resident leopard has also been seen recently, crossing the road near Katekani Lodge. It seems to be with a cub on most occasions, a nice addition to the family. The game drives in Balule Olifants West have provided me with some memorable sightings. The best of which would have to a black rhino sighting with its young calf. It was a great find in the late afternoon, they both could be seen in the distance enjoying an afternoon drink. We sat and watched them as they slowly moved away up the mountain side, and then disappeared. It wasn’t long after this awesome sighting that we found ourselves surrounded by a breeding herd of elephants. The youngest of the calves was very inquisitive, and took an immediate interest in my vehicle. With its trunk raised to smell what we were, it slowly approached the vehicle. Mom of course then appeared and it ran off with its ears flapping, in the opposite direction. Elephants must be the most incredible animals to watch. They have such a strong bond with one another, and each one has its own personality. As summer is almost in full swing we are feeling the heat more intensely every day. We have been experiencing very hot days and then some thunder storms in the evenings or early morning hours. But very little rain has fallen. I have been to Kruger National Park every day for about two and a half weeks and the sightings have been amazing. The Lion seem to be hanging around the area of Satara, I haven’t been going south at all apart from the occasional Leopard sighting. With the intense heat the animals are very stationary so it has been a good few weeks in the park. 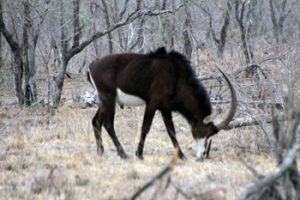 One of the sightings that I found was really amazing was that of a sable antelope on the S140. Photo of Rare Sable Antelope Bull. We also came across an African Rock python that had been run over by a vehicle – that there were a few White Headed Vultures eating it. This is amazing because these birds are Critically Endangered with only a few thousand individuals left according to recent studies in 2015. I moved to Katekani Tented Lodge the end of last month and although I miss Marc’s Camp I am settling into my new home. The staff here really makes me feel at home. We welcomed a new chef and a managing couple to the team. On the 22nd it was my birthday and Pierre baked me an amazing cake to celebrate with the guests. With the little rain we received comes even more bugs and spiders. We have found a few scorpions and a lot of flying friends. As the months go by I start to more appreciate the smaller sightings and what I can learn from Ne’s small wonders. The few rain drops which fell brought about a slight change in our natural vegetation. It did not rain for a long time yet it had an impact on the environment whereby our animals began to make some movement to show appreciation from the feeding pattern point of view. The Olifants river attracts different animal species. On our Bush walks one could be sure of good sightings including a lioness on the other side of the river. Herds and herds of buffaloes are being seen. Elephants continue to feed from the bark of trees and push down trees a lot. Big male elephants were seen during the morning walks on several occasions. It is really beautiful to view such an enormous creature feeding while you are on foot on the same level. The Black rhino mother with a calf is never alone this time around at Balule west, down by the river. Zulu the male aggressive black rhino is back. Zulu stood some few metres away and stared at us with concern one morning before we could resume our walk activity. This shows there is life again in the veld when compared with the past months of drought condition. Big herd of buffaloes mobile southwards and walked adjacent to the lodge leading to the dam some metres away from the lodge. From the looks of things there is hope for better in the ecosystem as long we keep having some rain. Our full day drives in Kruger are improving from a sightseeing point of view. 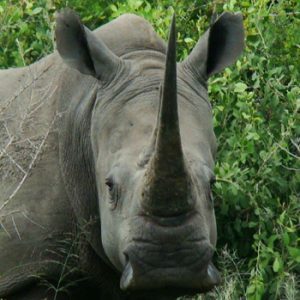 The white rhino bull seen along the S 125 is beautiful and guests had wonderful view. 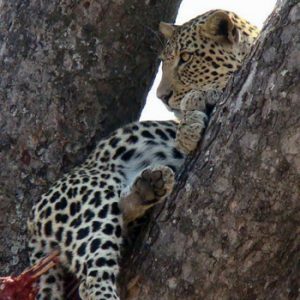 We saw a leopard in a tree on the S 125. 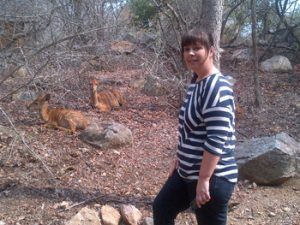 I have done a number of Bush Walks along the Olifants River this month. We always see Hippos and Crocodiles and some fantastic birdlife. On one occasion on our return drive to Tremisana we saw a beautiful cheetah sitting along the road – she didn’t even move when we got closer. Female Cheetah relaxing near road. Hippos & crocodile out of the water; 2 bulls elephants; 2 buffalo bulls are standard sightings on just about every Bush walk. Hippos & crocodile & giraffes; herd of buffalo around the river & black rhino (the irascible Zulu) at spruit. Buffalo herd near Tremisana Lodge. Elephants at Olifants river; 6 Bulls Elephants on Campfire; 1 bull White rhino on Olifants road; 2 bulls white rhino near Rome 1; Buffalos at tremisana Lodge; 4 giraffes on Sable road & 2 hyenas + pair of jackals with their 5 pups. 5th October: Bush walk : Lion on buffalo kill around 6 am on Maroela road – 2 lionesses. 7th October : Returning from boma a young leopard on Olifants road near Tremisana. 13th October : Met Zulu, the Black Rhino bull, near the river – mock charged us – got up to 5 metres from me, saw who we were and left us in peace. 22 October : Morning drive : 8 Lionesses on Sable road. 25 October : Morning Drive : Pair of jackals with their pups chases 2 hyenas away by biting them in lower hind legs.. I was allocated my first Sundowner Drive on the 28 of October – it was really amazing. We started off slowly and at first we saw a Giraffe really close up – the guests went wild ! When we got to the Olifants River, we saw a lot of animals including Bushbuck, Waterbuck, Buffalo, and the most interesting thing for me that day was the elephant bull that mud wallowed against the river bank. He started off by tusking the grounds, eventually he took some water from the river and sprayed it against the river bank where he tusked the ground after that he went and lay against the side of the river bank where he mudwallowed for a while and then got back up. As a new guide, I get the chance to go with other guides on drive to learn the roads where we traverse. I went out on 24 October on a Sundowner Drive. We had an elephant along the river busy feeding on to the reeds – it kept coming closer to us. At the river, he started to spray himself. We had a fantastic look at a Juvenile Fish Eagle near a nest. We stopped and had our sundowners on the airstrip and a lovely giraffe came across to have a look – maybe checking out what we were drinking! I had a lovely Sunset Drive on the 26th of October. We drove around, seeing a lot of antelope ( Kudu,Impala, Steenbok, Waterbuck ) We headed on our way to the spectacular Marula boma and had road block – surrounded by an entire breeding herd of elephants. Some of them were crossing so I reversed and gave them some space to cross. Once all had crossed we moved further on and came across a breeding herd of buffalo. At the boma itself we saw a small spotted genet and a porcupine. On our way back to the lodge we saw a bushbaby holding its baby – really cute! On another drive, we came quite close to a young elephant bull – a little stressed and he came up really close to the car. He came to investigate. Nico and I saw two Honey Badgers quite close chasing the Hyenas away. It was incredible. This month at Sweni Bridge we found a Big Male Leopard hunting impala. When it was got close, the impala saw him and ran off. He then lay down under a palm tree. We then found a pride of 20 lions on the S90 feeding on a buffalo. The cubs were full and were busy playing around. On 14 Oct on the S 100 we found 2 lions mating. On the 17 Oct we found 2 female lions feeding on young elephant on the S41. It looked like it died from the drought and was not killed. It was too big for only 2 lions. Again on the S136 Sweni road we found a fully grown kudu killed by a leopard. It was very close to the road. On 27 October before Nsemani Dam we saw another 2 lions mating and another 2 young brothers were lying about 50 metres from them. The drought is terrible. We were seeing one dead hippo per month in May and now we are seeing one per day! 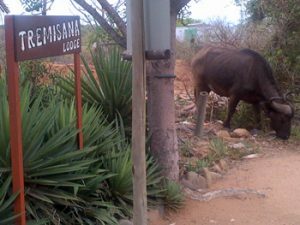 This month we’ve seen a lot of animals around Satara, along the S100 and the Sweni road. The presence of general game invite big cats such as lions and leopard. We managed to get lions on the S100 with buffalo kills several times. The lions are hunting during the day because they’ve got cubs to nurse. There are more hippopotamus dying due to shortage of grass but the lions are not even touching the dead ones. Nsemani dam is now dry but we were lucky to witness a lioness stalking an impala. 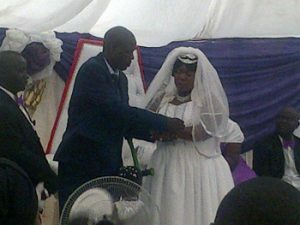 She chased it towards out open vehicle and all guests started screaming to save the life of the impala. The lioness was surprised to hear these strange screams and the impala got away. The number of leopard sightings recently has been really good – almost matching the lions. At Girivana dam we saw a leopard catching a francolin – these birds normally spend most of their time on the ground so young leopards often hunt them. We found a male cheetah on the S100 sleeping next to Xibotwana dam and saw White rhinos around Orpen. On the S90 we found lions feeding on an elephant calf – this was part of the lion pride of 17 which normally moves around here. The lions have been active around Tremisana. 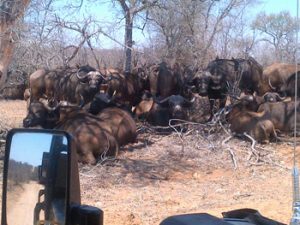 On 31 October the pride pulled down a Buffalo at the Warden’s car park. We dragged the carcass to a spot in front of the Boma where our guests had sightings of hyenas and vultures. Buffalo at TREMISANA front gate. The Vodacom tower will be moved to a spot behind the Tremisana car park. With the continued increase in guest numbers, we are building yet another staff room. Thatching of the main lodge has started and we will comb all roofs. We have completed the platform at Marula Boma and have added a waterhole. This has resulted in increased game activity. One very exciting report comes from Pretty. 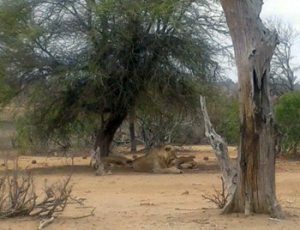 Last Sunday she and the helpers went early to Marula Boma to set up and guess what – a pride of lions was at the new waterhole. The one lioness then proceeded to move to the rocks surrounding our Boma. Pretty and staff were too terrified to get out of their vehicle. She phoned Rex, Eva and Elias who had 27 guests between them and asked them to come quickly to the Boma. All 3 vehicles arrived and the lions were still there. They did eventually push off and the guests were served a later than normal BBQ – they all agreed that it was the most exciting dinner ever !! We will be re-opening the Adventure Camp on 1 January 2017. In honour of Ronald Masango, previous Camp Manager and cornerstone of Viva Safaris, we are thinking of renaming the lodge Masango Lodge. The plan is to offer 3 day packages with both the Sunset Drive and Bush Walk on the Motlala Reserve. Joanne, our receptionist, at Marc’s Camp. There was a good downpour – about 20 mm – and there are shoots of grass sprouting. We have done the foundations for last 2 tented chalets – we hope that these will be completed by 1 April 2017. It will bring the total number of tented chalets to 8 and the number of beds to 16. I promise that this is the final tented chalet we will build. Luke, Given, Aron, Patti and co please take note – this is it !!! Thanks for the fantastic support – we are very full and we regret having no accommodation on certain days. As mentioned above, we will make more beds available to you by re-opening the Adventure Camp, probably to be renamed Masango Lodge. It has 8 units made of brick and mortar, a lovely large central reception/lounge/breakfast room, a super outdoor Boma and a good sized swimming pool. Our plan is to offer a 3 day safari : Day 1 includes transfer from Johannesburg and Sunset Drive on the Motlala property; Day 2 will be a full day in Kruger on open vehicles; Day 3 will include a Bush Walk along the Klaserie River and return transfer to Johannesburg via the Blyde Canyon. The tariff will be between those of the 3 day Lodge/Tent and 3 day Lodge/Treehouse packages. Will advise in next newsletter. Un luogo meraviglioso,gestito in maniera altrettanto meravigliosa da Allan ed Elena,assieme al loro team!persone squisite che ti fanno sentire a casa,con la loro ottima,e abbondante cucina e attraverso le attenzione che ti riservano. Le camere pulitissime sono veramente grandi e comode,sono presenti tutti i comfort,dal repellente per le zanzare al phon,inoltre quando rientrate la sera una calda boule vi aspetterà sotto le morbide coperte. Inoltre il Lodge è dotato di solo sei “tende” quindi la privacy e la calma sono un punto decisamente positivo della struttura. Una nota di merito va anche alla squadra di Viva Safaris che ha organizzato tutti i safari in maniera professionale. Se il Sudafrica ci è rimasto nel cuore, lo si deve anche alle persone che hanno contribuito a rendere speciale questo viaggio. Were a party of 5 (2 elderly and 3 young people) and did a 5 day Lodge/Treehouse safari. Our stay in Tremisana and Marc’s Treehouse Lodge was outstanding. we didn’t know what to expect when we made our reservation, but it really was far above and beyond our expectations. Every aspect of the safari was a great experience and we hope to come back one day. The safari’s in were thrilling and overwhelming. Visiting the Moholoholo Rehabilitation Centre was a confronting experience. While visiting the wonderful animals during the safari’s we felt so lucky to be able to watch them, but in the rehab centre we were made very clear that this might an utopia in the future. Animals got killed and tortured. This is terrible. In the rehab centre they do a great job. The Tshukudu Game Drive was the best way to end our safari experience. Tremisana Lodge and Marcs Treehouse Lodge are great places to stay, but the best part of our 5 day safari experience were the great people that accommodated us during these 5 days. They made it possible for us to create a memorable experience. While back at home we do really miss it. The (very) early bush walk was my favourite, being amongst it all really gives a flavour of the bush. The full day visit to Kruger was a long but rewarding day with many wonderful sightings. Although obviously, the game sightings are in part down to luck the guides did everything in their power to ensure was saw as much as we possibly could. Our twin room was charmingly rustic but Take plenty of mosquito deterrent as they are aplenty!